I like that, it would be pretty cool. But yeah the Earthmen, they must've set foot to set up Mother Brain and the network, correct? Either a few were sent permanently, or they returned, also stealing some of the produce, textiles, and such. But I gotta wonder about Palma, why nothing was ever said? I guess it could've somehow simply been the law to not speak about the Earthmen. I'd almost rather like to think their memories were toyed with! Those damned, shadowy Earthmen! Arrgh. Humans interbreeding with Palmans?? Would that be possible? Or would palmans also be of human origin (wich would make me wonder where did they come from in the first place)??? PSII: Why does Rudo have a grey uniform when attacking with knives (or is their something wrong with my screen)????? Last edited by Ome_Joop on Sun Aug 29, '10, 4:27 am, edited 2 times in total. Something might be wrong with your screen. His outfit is a green color on mine. I think the reason Rudo's uniform is gray for his melée sprite is to contrast it with the black background. Otherwise he might be hard to see. I think i posted this question a long time ago but still don't think it was ever answered!? What does that Darum guy do on the north bridge? If people are afraid to go outside he really doesn't have much to do as he being a highway man...? BTW Why is it impossible to cross the dam? (most dams in our world are without any problem?? Grey from the PS2 LP! Last edited by Ome_Joop on Mon Aug 30, '10, 12:39 am, edited 1 time in total. Ome_Joop wrote: What does that Darum guy do on the north bridge? Robs people of their money and belongings to pay for his daughter's ransom. Ome_Joop wrote: If people are afraid to go outside he really doesn't have much to do as he being a highway man...? There are probably a lot of hunters, military, Motavians, etc. that still wander around in the wilderness to places where teleportation can't reach. Ome_Joop wrote: BTW Why is it impossible to cross the dam? (most dams in our world are without any problem?? Considering the government, for whatever reasons, stores weapons in the dams, it's probably a good idea to keep the dams closed to pedestrian traffic. It's probably a good idea to keep people as far away from the dams as possible, actually. Seriously, no even the great LUTZ gets a 5 letter name. Darum does. another strange thing . 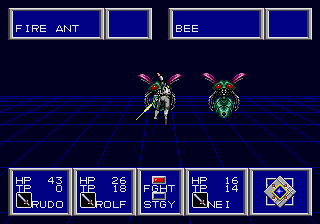 . . in Phantasy Star 3 from generation to generation, the main ladies don't age at all; while the guys do age (and get cheesy * star mustaches). Well.. they say women age slower than men.. so 20 years or 18 wouldn't change them that much.. The mustaches are because.. Kings must have 'staches. Everyone in power in anime must have a mustache.. either a mustache, pimped out hair, or a pimped out dress.